A hole in wood is a lot like a hole in your skin... if you're not careful, it can be a path for serious infection. The pin that had been on the left side of the mast is already missing. The rot caused by the hole is already visible. The rot is actually worse than it looks. It spread like a cone from top to bottom. If you put your hand under the partner and felt around, much of the left-hand side is soft and punky, and the hole is no longer tight enough to hold the pin. Oddly enough, the partner was still strong enough to support the mast, but this was mainly because of the 2 threaded stainless steel rods through the partner, the stainless steel mast step, and the SS plate bolted across the front. Steel holds up the mast. The wood is basically a spacer. However, the partner needed to be replaced as part of my Blue Moon refit. My goal is to strengthen all the rigging on the boat so that it is utterly trustworthy and easy to use. So the day finally came to cut away the rot. 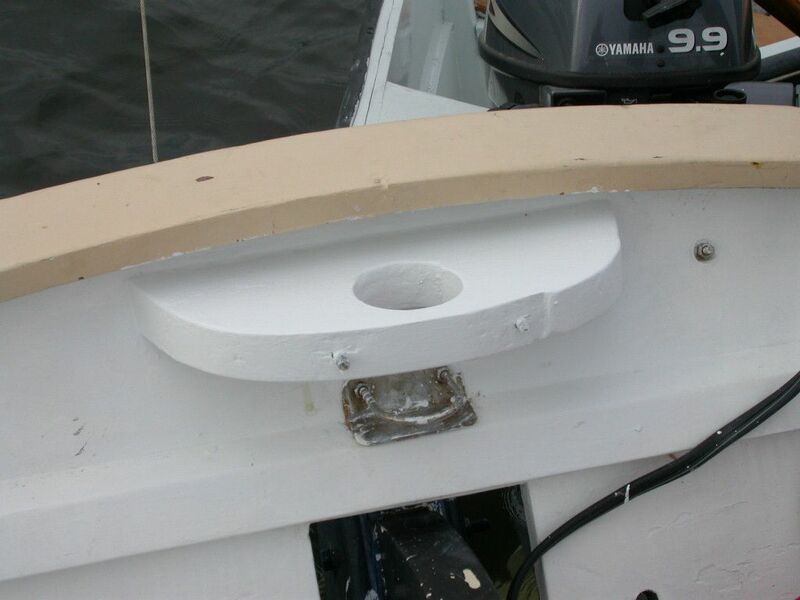 From looking at the photo below, you might wonder why I didn't just replace the whole mast step. That was Plan A, but those 4 steel rods proved very difficult to remove. 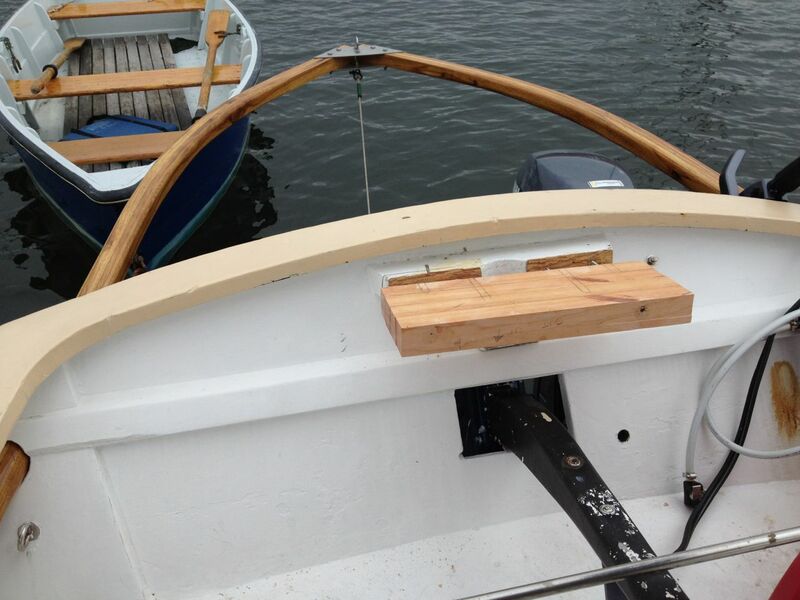 The wood is epoxied to the transom, and the rod threads are epoxied into the wood. The wood is hemmed in above and below by the cap rail and cross beam on the transom. 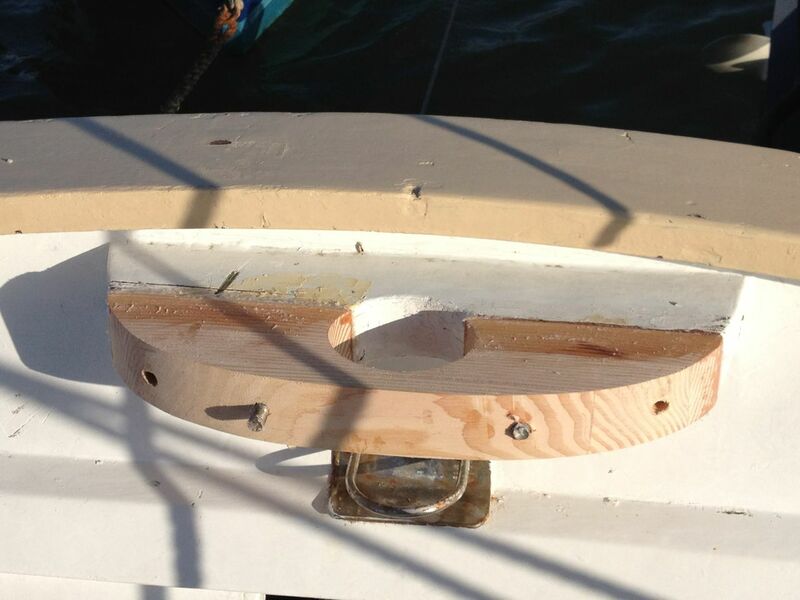 I actually tried to chisel the mast partner off the transom, but chickened out... I was afraid I'd end up with a big mess. With the rot removed, it was time to glue up the 'patch'. 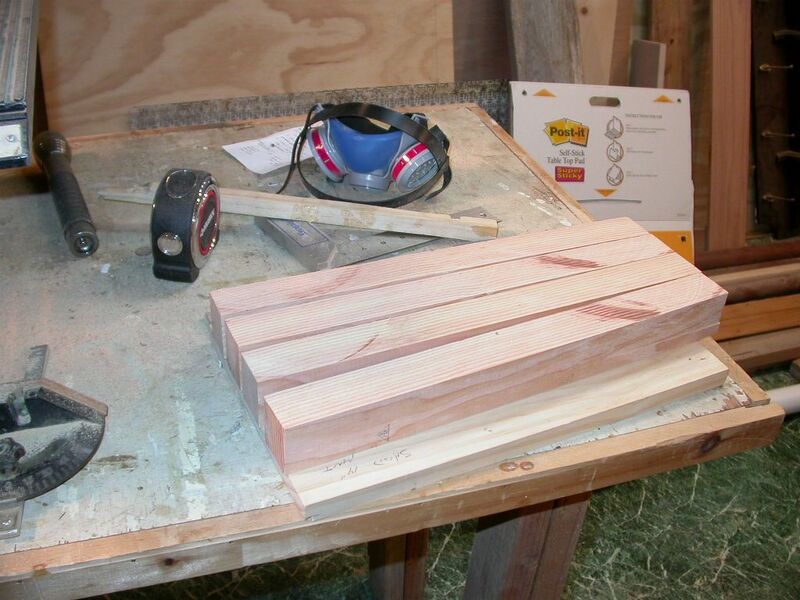 The mast partner was built out of Douglas Fir, but thicker than a normal 2x6. 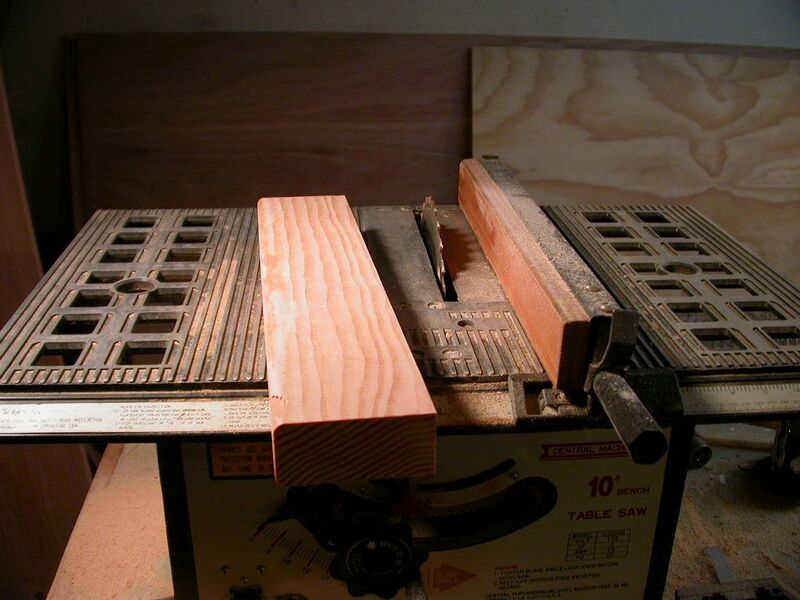 To replicate the proper thickness, I ripped strips on my new table saw. My friend Steve couldn't believe I'd gotten this far in woodworking without a table saw and gave me one of his old saws. After using it for a few projects, now I can't figure out how I did without it! Compared to gluing up my boomkin, gluing up this thing was a snap. Notice how all sides of the glue joints are open, so it was easy to remove the squeeze out before it dried. Always scrape away the squeeze out! The second tricky part was to drill 4 holes for those dang rods. Definitely time to remember my "Make mistakes slowly!" rule. 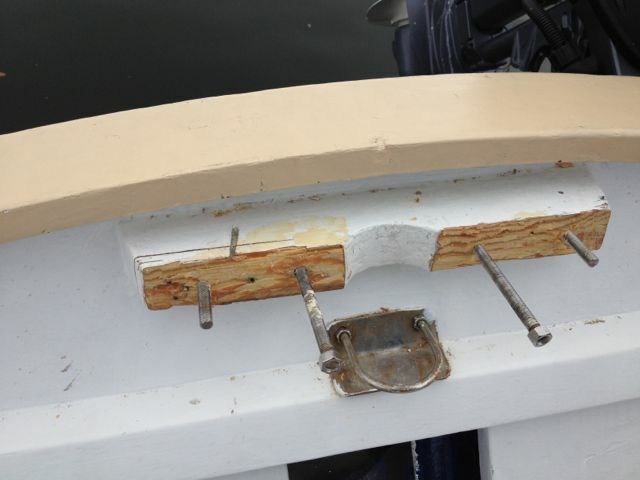 Back on the mooring, I used my old brace and a vice clamped to the rail to drill the 4 holes slowly and carefully, first a bit of one, then a bit of the other, and so on, until I had 4 holes that lined up more or less perfectly with the 4 rods. Once the holes were drilled, I took the piece back to the shop and cut it roughly to shape, and drilled the 'rest of the hole' with a hole cutter in my drill press. 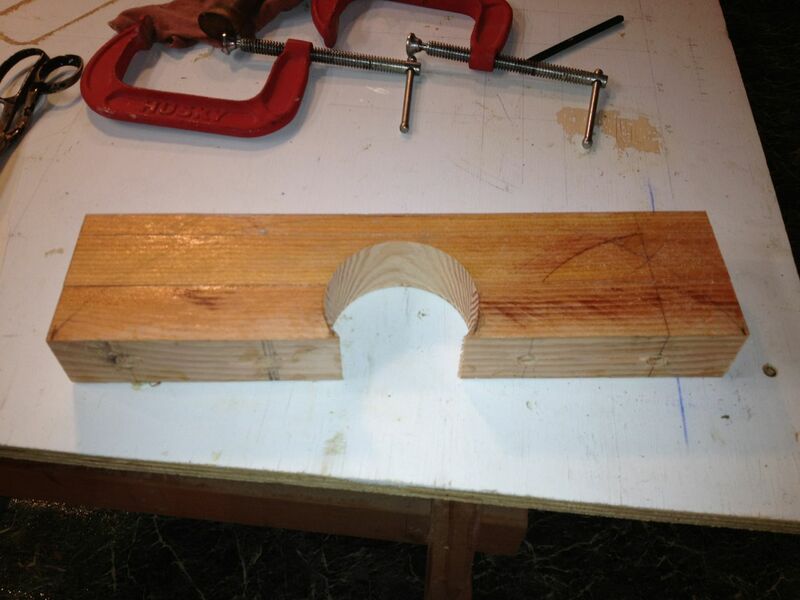 The piece now has the hole, and is the correct width and depth. You can just about make out the curve drawn on the top where I need to cut next. 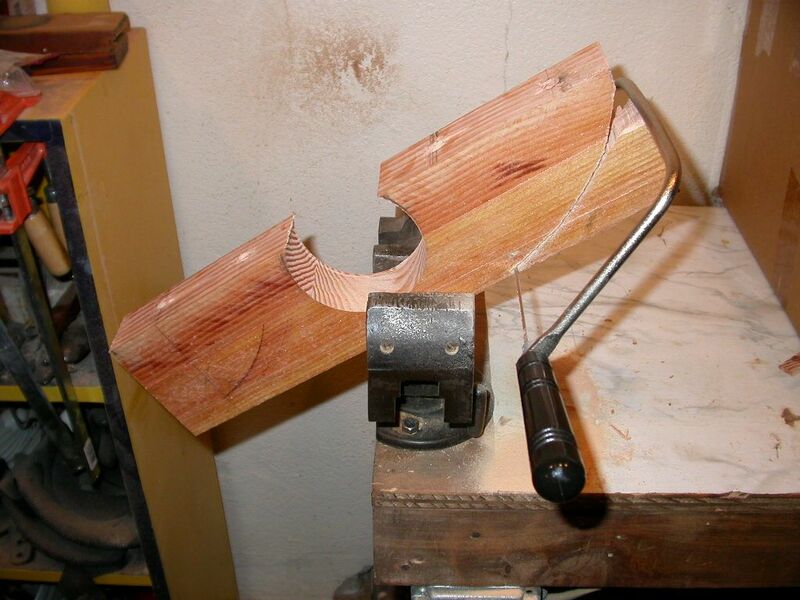 So, the next step was to cut the curve. 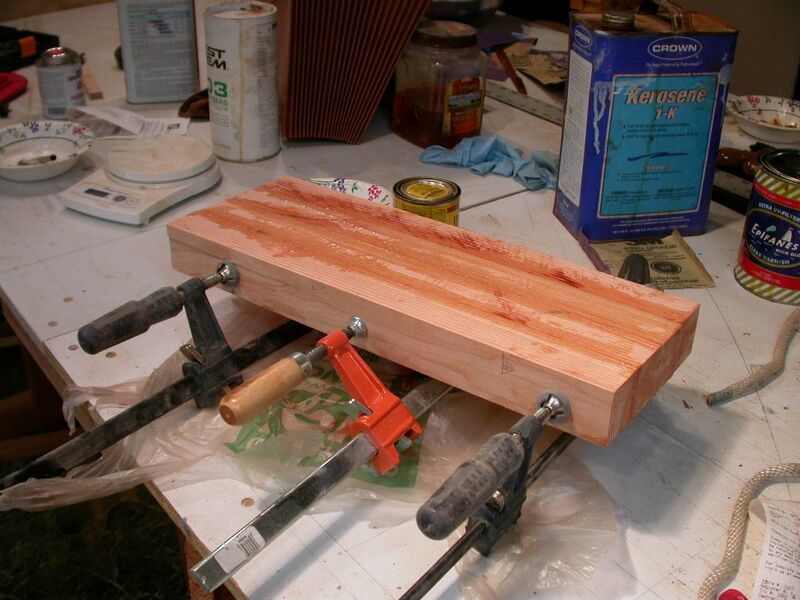 Easy-peasy with a bandsaw. Too bad my last blade broke on the first inch! If it was the middle of winter, I would have waited for UPS to deliver some new blades, but it's spring: I want that mizzen up for sailing! I'll skip the sanding part. Sanding is boring. The next day, I epoxied it in place. Surprise, surprise... almost a perfect fit. If you're sharp-eyed, you might be wondering "why is the right rod shorter than the left rod?" Good question, and one that caused me infinite pain... the last half-inch of the right rod had gotten bent at a good 30 degree angle sometime in the distant past. It was impossible to straighten it, and impossible to drill the 4 holes with the bend in the rod, so while I was drilling my holes, I cut off the bent part. Now I was faced with the consequences of that (rash?) decision. With the steel plate installed, there wasn't enough exposed thread to hold the nut. 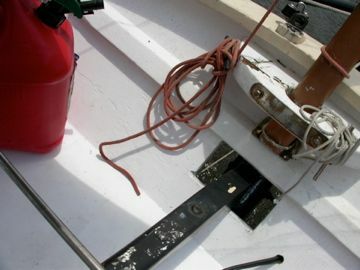 I still couldn't remove the rod to replace it (the obvious thing to do) -- it was still epoxied firmly into the mast partner. After a whole lot of thinking, I remembered my old engineering professor at RPI telling us: "Perfection is the enemy of 'good enough'". I took out my chisel and cut away just enough to allow for the installation of the plate. Problem solved. No perfect, but 'good enough'. While the paint dries and we wait for some stormy weather to pass, I'm working on new running rigging for my mizzen -- along the same lines as I imagined over a year ago. >>> Next Episode: Mizzen Up! Looks good to me John. Hope the weather clears soon. If you need to remove epoxied in steel apply heat. The epoxy will soften at a temperature around 70ºC & then you can unscrew the thread. In this case I'd have put up a temporary shield over the timber & used a small gas torch on the exposed rod end. H'mmm. Now that's a good trick to remember. Thanks! Nice job. I was gonna say what Anon said about heating those epoxied-in rods with a torch .. but he already said that.